I don’t know if it’s just me, or is the Internet-based virtual world called Second Life getting a lot of attention lately? All the news and reports from this virtual world have finally caught my attention, and after reading the post My Second Life and the post Presenting in RL/SL, I have decided to see for myself what all the fuss is about. The first thing to do was of course to download the application and create a Second Life (SL) account. And so it was that on January 31st 2007 iAlja Writer was born. Yes, that is my SL name (by the way - if you’re wondering about the last name: when signing up you have to pick a last name from a list of names, so you can’t just make up any name you want). After that was done, I was finally able to sign in and take a first look around. At first I didn’t get very lucky as an update was scheduled just around my first day in Second Life, so I was soon unable to log in. Argh! But it takes more than a maintenance outage to stop a curious educator from exploring new worlds. 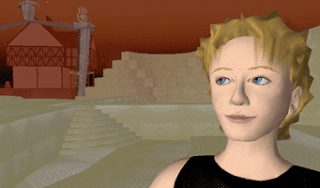 When Second Life was back online, iAlja Writer finally took her first steps in her Second Life. Walking around is pretty easy (just use the arrow keys) and if you want a better view of the world, you can also fly and view it from air. Then I completed the challenge of setting up the appearance of my avatar. This can be done with the help of a quite simple and powerful editor (a more complex version of the Mii editor on the Wii). You also have many other tools that can be used to teleport between places, chat, edit you profile, join groups, search etc. - and yes, figuring all that out takes some time, but after an hour or two I was able to master basic tools, menus, and other UI elements. The UI is quite basic, but can be learned quite fast, and you also get an essential SL tutorial right as you step into the world. But although the basic functions are quite simple to learn, I must say that the key word for my first days in SL was confusing. I don’t really know why, but I really felt confused and disoriented. I felt there was still so much of basic tools to find and learn, when in fact I already knew how to use the basic tools of SL. Anyhow, the thing I was of course most interested in was meeting people (fellow educators trying to figure out SL if possible :) ). And to meet the right kind of people you of course have to go to the right kind of places, like the EduNation island, Campus: Second Life, Sloodleville (a place where people are trying to bring Moodle to Second Life) and many more. For this reason I did a little search on the web and among SL places, events and groups, and was soon able to find places where educators meet and where links to other edu spaces can be found. The only thing that bothered me was that I didn’t really got to meet a lot of people in the first days, as the edu places were mostly empty - I guess I’m in the wrong time zone :( But then I finally came across some interesting people and had some interesting conversations. I was really pleased to see that many people were willing to talk, answer my stupid questions (like: Who controls the weather in this place?) and share their experience and knowledge of SL (or other areas of 1st life :) ). Talking to people in SL is basically like using IRC, but much much more fun because you can in a way see other people and to some extent communicate non-verbally. I was quite impressed by the way SL avatars (characters) behave - they really seem alive. When you stand still they start looking at their watch (even if you don’t have one) or look around the place or just stare at their feet (that’s just what I’d do if I had to stand still in one spot!). You can also make your avatar do different gestures. Also, I find the pose that avatars assume when they are typing really great. It’s a great way to show that a person is writing something! Voice chat can also be used in SL, but as I don’t have a microphone for my Mac Mini I was yet unable to test it, but I think it would add a lot fun and realism to conversations. So, SL Voice Chat is definitely on my to-do list! Another thing that impressed me was the variety of locations, places in Second Life. You have everything from clubs, shops and even museums. You can even race with Go-Karts, take a swim in WaterWarks or go to a party and dance a bit (check out this list of 5 free fun things in SL). From the places I visited I especially enjoyed the International Spaceflight Museum, which can also be a great place for learning. So, is all this any good for education? I think SL is a great learning tool for programming or computer science students as you can build object and add various scripts to them, so it’s a fun tool to practice or learn about 3D modeling and programming. 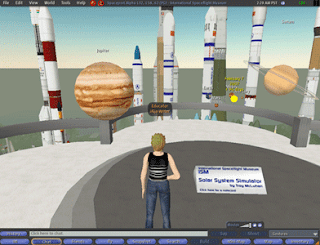 I am a bit afraid that our (business and management) students would find the world a bit too confusing, though it could be a great way to practice business skills as you can trade various objects or land in Second Life (using Linden dollars). For this reason I think that you could have different modes in SL; for example: one very basic for people just interesting in going to places, meeting people and maybe buying stuff; then a business mode that would highly focus on the business aspects of SL; and finally an advanced mode for programmers and 3D designers. Basically, I think that SL and other virtual worlds have educational potential, but they should become even more intuitive and user friendly. A lot of people I met on help an information islands were feeling very confused by this new world and that can be a serious barrier for a wider adoption of virtual worlds. Although, walking around SL did give me an interesting idea - what if future operating systems would adopt the characteristics of virtual worlds? Try to imagine - we already use the metaphor of desktops as the place where application are run, so why couldn’t we have a 3D office instead? A 3D office in which you can have pictures on your walls, of course choose wall colors or wallpapers, and have different office applications around the office - either on the desk or sorted on shelves. And when not working you could go to your leisure room with an audio and video system, and shelves of music/videos. Basically, each user could customize his/her own house and different rooms by dragging objects around the place, also between rooms (if it sounds familiar - something similar will be done with Spaces in the next version of Mac OS X Leopard (and probably 5 years later as Places in the new Windows version that Microsoft will claim as a new and innovative feature)). You could of course also have rooms for kids in which parents could control some of the content and you could invite your friends to your house and show him/her how you just redecorated your office or you work with that document or go to a public space to see a movie, hear some new music, talk with friends or strangers. Everything would of course be connected to the internet and you could for example watch YouTube videos in your video room. I think that might be possible in the future when better graphics, higher Internet speeds and computer power will be available - that or the alternative in which our houses will have screens in every room. But as the trend is moving to mobile technologies I think it’d be much easier to make the OS a 3D environment that you can carry around with you and work in your office in the fresh air while sitting in a park. We’ll see.